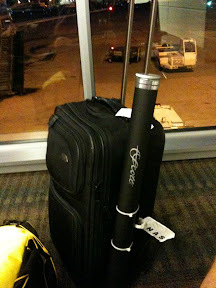 The bags are packed and I'm at the airport ready to head to the keys. It's been a busy few days getting ready but it's finally time to go catch some fish. Check out this new fancy piece of fishing luggage. It's a one of a kind prototype I'm trying out for this trip. Yesterday I did a guest blog on DIY bonefishing Web site. Rod who runs the site does a great job and you should check out his sitehere. More to come here over the course of the trip.